The recent killings of human rights workers Elisa Badayos and Eleoterio Moises on November 28, 2017 in Negros Oriental (Central Philippines) is most brazen, as they were killed by motorcycle -riding in tandem while conducting fact-finding mission in the area due to intensified militarization. Strikes and peaceful demonstrations have been violently dispersed. Trade union leaders and members were arrested or threatened with arrests. There are cases of military agents conducting surveillance and harassing labor organizers in their homes. President Duterte has threatened to escalate state repression and conduct a crackdown on all institutions and organizations that are opposing him. Many trade unions, people's organizations, progressive politicians, and human rights and church groups have opposed President Duterte’s War on Drugs, Martial Law in Mindanao, his support for US bases and militarism in the country and across Asia Pacific, and his adherence to neoliberal policies that favor multinational corporations and foreign investors. The death toll on War on Drugs has reached 13,000, which means a close to 1,000 people are being killed monthly. Most of the victims are poor, suspected, and those who oppose to take part in the program. The genocide during the imposition of Martial in Mindanao has terrorized communities, mostly those belonging to Muslims and indigenous people. At least 12 incidents of aerial bombings in different parts of the country have been reported. Heads of government offices like the Supreme Court, Office of the Ombudsman, and Commission on Human Rights are being pressured with threat of impeachment and filing of cases. Members of mass media have been warned of being pressed charges or their offices shut down if so-called ‘fake news’ or reports opposing the administration will be released. 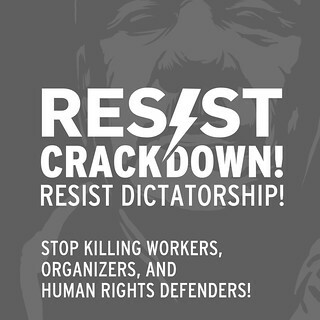 As Filipino workers and people resist President Duterte’s threat of crackdown and dictatorship, we urge our fellow trade unionists, labor activists, and human rights defenders, to show their support. ● The Philippine Government to observe the ILO Conventions 87-Freedom of Association and Protection of the Right to Organize, and 98-Right to Organize and Collective Bargaining.